Any residential or commercial building project needs to start with a solid foundation. Not only does the foundation contribute to the building’s overall structure integrity, but it also can offer protection against flood damage and other hazards. This is especially important when you are constructing with metal, as the foundation requirements are often more complex than you may think at first. The foundation needs to be able to anchor your building while also being able to respond correctly to loads placed upon it and distribute the energy transfer. 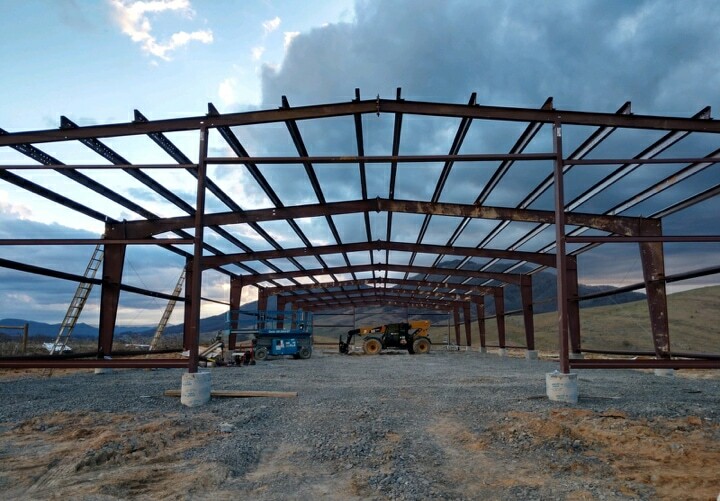 If you are erecting a steel building, you will need a foundation of knowledge (pun intended, of course) on foundations in order to get started. In this piece, we will go over key considerations for steel building foundations, introduce some of the most common types of foundations, and provide some additional tips and advice to get you going on the right track. Take stock of the plot where you plan to install the foundation. In particular, focus on the quality of the soil. If it is weak, consider replacing it before proceeding. Is the area where you are building subject to frequent high winds or unstable ground (i.e. from earthquakes or tremors)? Then you may need to incorporate a higher footing size and/or steel tie bars and anchor bolts into the design of your foundation. This will help to compensate for the stresses associated with your steel building’s high horizontal load. If wind uplift is a particular problem in your area, this is something you will need to prepare for as well. The way to do this is to either use deeper footings or increase the foundation’s weight. Topsoil is another possibility. With the right design options, you can prevent columnar uplift. Key Point: Before you select a type of foundation, take into account factors such as the building’s dimensions and horizontal and vertical load, the quality of the soil, wind conditions, and tremors. 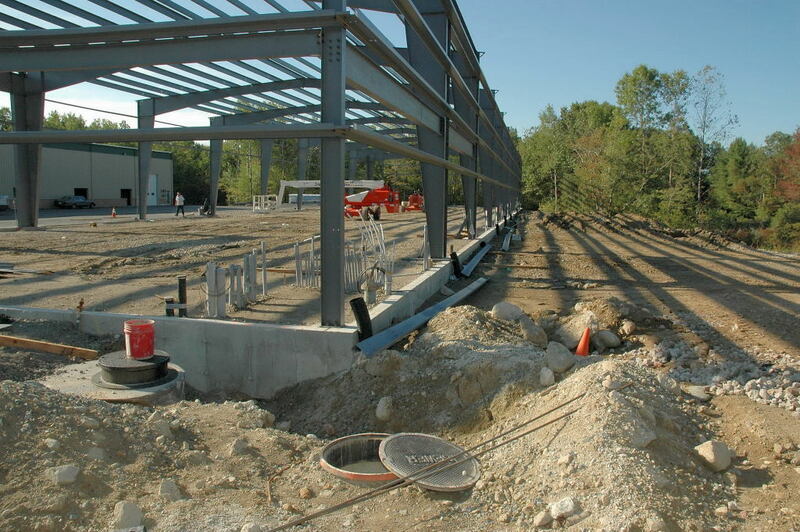 Now that you are aware of some of the potential challenges associated with creating a strong and stable steel building foundation, let’s review some foundation types. This type of foundation sometimes goes by the name “floating slab” or “floating foundation”—though this can be something of a misnomer (see the “Note” below). To create this type of foundation, builders pour concrete and reinforce it. Once the slab is finished, it may measure anywhere from 3-1/2” and 5-1/2” in thickness. It doubles as the structure’s floor, and can incorporate deep footings when necessary. Ideal For: Consider a slab foundation if you are erecting an industrial structure. You can save both money and time with it, and keep labor to a minimum. It offers superior stability when soil quality is poor. Note: Though the terms “floating slab,” “slab,” and “floating foundation” are sometimes used interchangeably, “floating slab” may refer more specifically to a hybrid between a slab and a curb foundation (see below). This type of foundation is different from a slab in that it consists of a “curb” of poured and reinforced concrete around the perimeter where the structure will be installed. No concrete is poured within that perimeter. The walls are placed atop the curb when construction commences on the main building. The footings are installed with the curb. If there will be weight-bearing walls within the structure, it becomes necessary to add more curbs to serve as their foundations. Foundations which include multiple curbs in this manner are called “ribbon” foundations. Ideal For: You might consider this house foundation type if you wish to install a crawl space. It can save money over traditional basement design. Just keep in mind that if the area where you live is prone to moisture and mold, a crawl space can create problems. They also tend to become a favorite habitat of pests. As mentioned in the “Note” section previously, this is a hybrid between a traditional slab and a curb design. Construction begins with the installation of a curb foundation. Once the curb and footings are in place, the builders pour a slab within the established perimeters. Ideal For: The reason to consider installing this type of hybrid foundation is if you essentially want a slab foundation (rather than a crawl space), but you are worried about settling resulting in damage. The hybrid design provides more “buffer” to the foundation, allowing it to settle without being compromised. With this type of foundation, reinforced concrete piers are installed deep in the ground around the perimeter where the structure will be installed. These are able to support building’s vertical load. A grade beam wall is integrated in order to counteract horizontal load stresses. Ideal For: Consider this type of foundation in locations where you are concerned about wind uplift, and have reasonably dry, packed, stable soil to work with. Pier foundations are popular in the agricultural sector, but may be used for a variety of other structures in diverse industries. Exactly as its name implies, a portable foundation is one which can be picked up and moved. Ideal For: Obviously, you would consider this type of foundation if you are setting down a building which you may later expect to relocate, particularly if you will do so on a frequent basis. It also has benefits from a cost-saving perspective, and can cut down on the time and labor required for installation. We see this used frequently with portable office buildings on construction sites. Key Point: There are a number of different types of foundations you can choose from for your steel building. These include slab, curb, floating slab, pier and portable foundations. Now that you are familiar with the different types of steel building foundations, let’s go over a few more tips. A foundation is only going to be as strong as its materials. Ensure that you have the right proportions of ingredients in your concrete mix. The resulting compression strength should be around 3,000 pounds per square inch. If you want added strength, you can consider fly ash or other admixtures. In order to have your concrete set properly, you will need to construct sturdy forms. If your forms buckle under pressure, your concrete will not dry as intended. The final shape will have imperfections. When you pour your concrete, ensure that you’ve done so evenly, and that it is free of bubbles and Latinate. Once the concrete is poured, complete the screening and finishing processes, and then wait for it to cure. Plan in advance to make sure that your concrete has time to cure properly. Do your best to schedule your pouring so that your concrete will have at least 72 hours in which to set without being exposed to precipitation. The weather shouldn’t be too hot or too cold. The ideal temperature range is anywhere from 50-90 degrees Fahrenheit. If the weather is on the cold side, expect curing to take a little longer. Do not rush to the next stages of your project. Wait until the foundation has fully set. Whatever you do, do not try and put down a concrete foundation in freezing weather. If frost forms, your concrete could crack during the curing process. The resulting foundation might be 50% weaker. Previously, we talked about how poor soil conditions can be problematic when you need to erect a steel building. While you do not have to replace the soil, you may want to think about it. Even though it adds some extra steps, you may find that overall, it saves you time and money with your foundation. Fully dehydrate your concrete before you get to work. This process may take several weeks. Want to speed up the curing process? There are chemicals you can consider, but steer clear of one called “calcium chloride.” While this chemical may be fine to use in other building projects, it is a poor choice for a steel structure as it can lead to corrosion. Key Point: The quality of your building foundation will rest not only on the type of foundation that you choose, but also how professionally you install it. Where Can You Get Help With Your Steel Building Foundation? If you are able to handle the work on your steel building foundation yourself, that can certainly save you money. But if you are not confident proceeding, calling in the experts may be the right move.